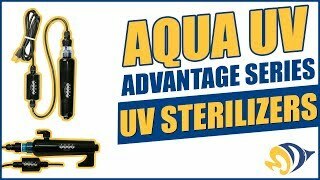 Aqua UV 8W Advantage 2000 HOB UV Sterilizer The Advantage Series is ideal for small ponds, aquariums, and water features. Advantage UV`s are slim, lightweight units designed for maximum UV effectiveness. Aqua Ultraviolet UV`s will clear your water in 3 to 5 days sometimes overnight and keep it that way. Performance is guaranteed when sized, installed and operated according to our instructions. Outlet spout accommodates aquarium frames up to 1"
What is a Sterilizer? A sterilizer will eliminate green water and control bacteria. The Advantage 2000, 8 Watt, will sterilize up to 200 gallons of fresh water or 70 gallons of salt water. What is a Clarifier? Used as a Clarifier the Advantage 2000, 8 Watt will control green water in a freshwater environment of up to 1,500 gallons that has 50% to 75% plant coverage and partial shade. I received my sterilizer 11/114/18 in the afternoon, I paired it with the Ehiem Classic 600 and man what a difference just 12 hours have made. I am using it on my 150 gallon discus tank. I would highly recommend this sterilizer. I have had this running for about a week. Easy to set up, and run. The return is kind of weird, but if you have it running back into a tank or sump no problem. I have mine in my sump. Easy hooking up right to the filter crystal clear water like in two days...a must have in salt water aquarium. Works good on my 55 gallon salt water tank. Had a marron clown fish that started to get ich ... All gone after getting this uv sterlizer like an two days! clown fish is better than ever.